There are some whose enjoyment of performances centres on the sonorities chosen by the composer: how things sounded with even temperament, how certain things took on �dark� tones while others � the eternally sunny key of C � have a far brighter tone. Some far prefer performances on modern instruments with stronger, more vivid timbres and notes that don�t sound �plinky� or out of tune. Peter Katin here lays out a case for the square piano to be seen as many today see the harpsichord or clavichord: as offshoots of the overall development of the keyboard instrument. The square piano has its own specifically tailored literature. Clementi�s family made square pianos and the music Clementi composed for piano takes such limitations in its stride. My grandfather and uncle - and my uncle has a square piano - would argue that in all likelihood, if Clementi had a square piano and a modern grand in front of him Clementi would have chosen the grand. There are definite limitations to the instrument�s capability. The action is less precise and noisier, with whirrings and clicks. The tone is an intermediate step from the clavichord, with a bell-like upper register. 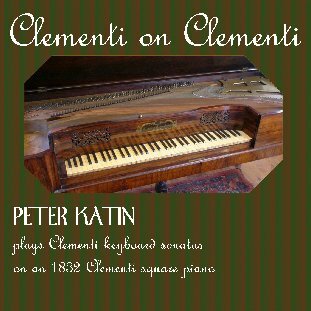 Katin altered his decision on which sonatas to include once he began using the instrument on this recording � a rosewood piano from 1832 manufactured by the Clementi family firm. These sonatas wouldn�t necessarily be the first ones that would come to mind from Clementi�s output. The disc begins with the quiet and unassuming Op. 25 no. 5 in f-sharp minor. This was a conscious choice designed to bring out the sonorities and timbre peculiar to this type of instrument, especially with its trademark use of thirds in the upper register in the first and last movements. The elegiac andante is a lovely movement on any piano, and Katin�s playing is a treat to hear. The second sonata offered is the cheerful and Mozartean Op. 24 no. 2. This is sunny, extrovert and engaging, sharing thematic elements in its first and last movements. These serve as bookends to the contemplative but no less positive slow movement. The g-minor sonata Op. 7 no. 3 is the first departure from score indications, perhaps as a nod to the limitations of the instrument. The first movement is not an allegro con spirito but a moderato, almost andante. While this brings out the singing nature of the instrument, it may not be quite what the composer intended. After the ending of this first movement, the Cantabile e lento seems not that much slower. This Cantabile is almost four minutes of reverence and beauty followed by a Presto that does well at showing off the Clementi square piano�s capability. That said, the sound of the action in the quicksilver runs � something like twigs snapping � under the lid of such a rare instrument can be rather alarming. The last example is from the list of �likely Clementi sonatas�. It is the most Beethovenian of the set and has an unsettled quality in spite of aspects that at times could almost be seen as cheerful. The second movement is restlessly despondent: pauses filled with a sense of loss beautifully brought out by Katin. The triple meter finale is wonderful work of energy and drive but ends indecisively as if quieted by some other impulse. This makes for an odd end to what many period-instrument lovers will likely find an intriguing disc. There are not that many recordings on the square piano. This is, as with Beethoven�s Broadwood, an opportunity to hear how a composer�s works sounded at the time they were written.